Wilson Canyon is a short drainage, only about 1.5 miles long, on the south side of Wilson Mountain, and is bordered to the west by a ridge lined by pinnacles and buttes of red and white sandstone, terminating in the well known Sedona landmark of Steamboat Rock. The other side of the valley is less dramatic; here, party wooded slopes rise towards an intermediate plateau, course of the Wilson Mountain Trail. This path begins at the mouth of the valley, as does the Wilson Canyon Trail, which follows the overgrown drainage along the canyon floor, past a few seasonal pools and little falls, then rises above the trees and ends at a viewpoint on a red rock knoll. This mostly treeless location has fine views of this sheer, irregular cliffs that enclose the upper end of the canyon on three sides, and back down the valley floor towards more red buttes to the south, on the far side of Oak Creek. Prior to this, views along the hike are somewhat limited owing to the trees, but the shady, moist conditions alongside the creekbed are good habitat for wildflowers, mingling with cacti and agave on the drier slopes above. Wilson Canyon topographic map, Sedona location map. Parking for the Wilson Canyon Trail is along AZ 89A at Midgely Bridge; a very popular location, mostly used by people walking down to the pools beneath the bridge, and to Oak Creek just beyond. A fee of $5 is charged for parking, paid to a self service machine. The lot often fills up as early as 10 am, and since all the nearby verges have No Parking notices, the next nearest place is Grasshopper Point picnic area, where the cost is higher ($8) but many more spaces are available. From here, Midgely Bridge is a 0.8 mile walk away, mostly along the Huckabee Trail. 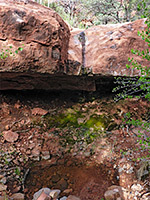 The trail up Wilson Canyon starts along an old road bed, once course of the main highway between Sedona and Flagstaff, prior to construction of Midgely Bridge over the lower end of the canyon in the 1930s; the opposite section of the old road can be seen on the far side of the ravine, which becomes quickly narrower and shallower as the path moves north. The Wilson Mountain Trail forks off just after the rest rooms at the start of the path, which divides again 500 feet later - right is the official route, though both branches rejoin not for ahead. 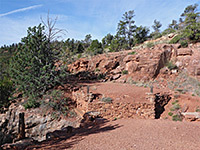 The lower (left) path continues on the old road a short distance further, to the stone supports for the bridge which once crossed the canyon, now just 15 feet deep, then enters more wooded ground, across a tributary streambed and on to a junction beside a sign marking the edge of Red Rock Secret Mountain Wilderness. The Jim Thompson Trail forks off to the left, crossing bushy, undulating land for 4.8 miles, past the base of Steamboat Rock, to a trailhead along Jordan Road in Sedona. 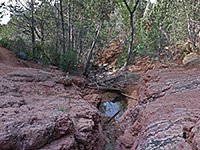 The Wilson Canyon Trail crosses the creekbed a few more times, staying in the shady oak and cypress woodland, within sight of some small dryfalls, one of which is somewhat taller (ten feet), and in spring has dripping water and a pool underneath. The trail moves away from the streamway, across a patch of manzanita, then returns to the wash, and soon ends, officially, at a point marked by a notice on top of a tall cairn, though a short continuation path climbs the slopes to the east, up about 100 feet to a sloping ridgeline and the final viewpoint, which is mostly unobscured by bushes. 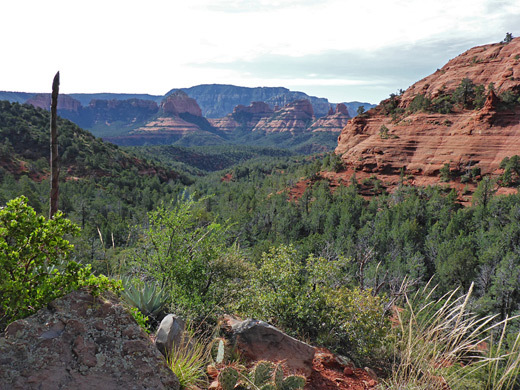 The enclosing cliffs rise up to 2,000 feet higher, formed of yellow-brown Coconino sandstone on the higher reaches and red Schnebly Hill sandstone lower down - this rock layer also makes up several isolated pinnacles in the lower reaches of the canyon, rising above the green trees. Wilson Canyon can also be viewed from high above, at the end of one branch of the Wilson Mountain Trail.